As some may know and some may not, Corridor Gallery has to announce the very sad news that we are closing our doors at the end of the year. 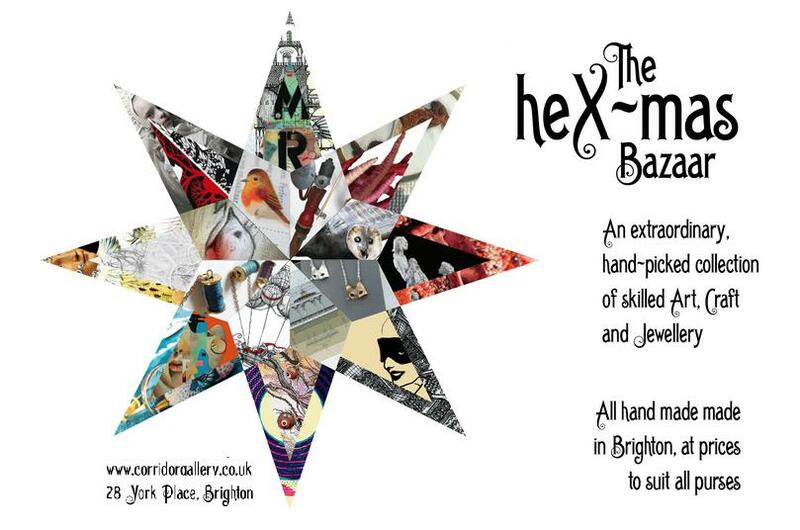 To commiserate and celebrate we would love you to come and join in our very own “heX-mas Bazaar”. For the entire month of December, starting on Dec 7th Corridor Gallery will be celebrating all of our artists shown over the past 15 months: some of the best and most skilful talents Brighton has to offer. We will be filling the gallery with their incredible artworks, jewellery, objet-d’art, gifts, cards, prints and sculptures, all created by talented Brightonian artists and makers, of whom we have had the privilege of showcasing since our doors opened in September 2015. We are confident you will find nowhere else with such a range and diversity of wonderfully talented and high quality original works at prices that everyone can afford for themselves or others during the festive season. With the building being sold by its previous owners, Brighton and Hove City Council, it means the closure of Corridor Gallery on the 31st December will be accompanied by closure of the studios housed on the premises also. Our own 15 month existence in this wonderful and exciting space is eclipsed by the 19 years this space has housed Brighton’s immense creativity. Twenty-eight York Place has seen painters, printmakers, leather workers, photographers, jewellers, sculptures, illustrators, glass workers and many more grace its rooms and its gallery walls throughout the last two decades. We feel privileged and honoured to be part of the history of this amazing building. The co-operative behind Corridor Gallery, Diversis Artibus Co-op Ltd, have dedicated our energy to celebrating Brighton’s truly vast talents and have endeavoured to bring this talent into the forefront of Brighton life. For the last three years we have worked hard, funded our projects and volunteered our time to the shared vision of a creative space for all to experience and enjoy and this is what the gallery space has given us. We have loved our time at 28 York Place. What a journey!! So, from Corridor Gallery and Diversis Artibus, we would like to say thank you to all the artists and visitors who have shown and supported our gallery with a month long extravaganza of artwork, jewellery, sculpture and maybe a few mulled wines or three. This entry was posted on November 25, 2016 by mptask in Brighton, Corridor Gallery, December 2016 and tagged art, art exhibition, brighton, Corridor Gallery, Diversis Artibus, heX-mas Bazaar.